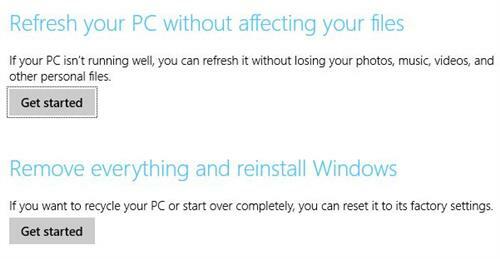 Where’s Refresh/Reset in Windows 8.1? Sometimes, it’s MIA! Under some conditions neither of these options will appear on the Update and Recovery settings page. Reports have surfaced in both Neowin and McAkins Online that using an online download to update from Windows 8 to 8.1 sometimes causes these options (and the underlying functionality) to become unavailable to Windows installations. The remedy in this case is to provide a working ISO (or installable image) for Windows 8.1 from which the necessary ESD (electronic software download) files that contain the OS source image may be read. Numerous articles explain how to build a usable UFD or DVD ISO for Windows 8.1, including this follow-up piece at McAkins which I have followed and used myself to generate a bootable UFD containing the Windows 8.1 installer files (I can’t get it to work with a Windows 8 key, but that’s a whole ‘nother problem already documented extensively in other recent blogs last week). Given a source for the necessary files, the reset or refresh operations will work properly from that media.